What Is a Luxury Rehab Center? Look for medically supervised detoxification services. Make sure the program has highly trained and credentialed medical staff such as doctors, psychiatrists and therapists. Check to see if the staff have experience treating dual diagnosis or co-occurring disorders that may accompany substance abuse including anxiety, depression, sleep disorders and other mental health conditions. See if the program offers treatment plans and therapy tailored to your individual needs. Be sure you can cover the cost of a luxury recovery center. Who Answers? to speak to a treatment support specialist about drug and alcohol rehab options in your area, including luxury programs. Luxury programs offer posh settings, holistic treatment options and experiences that are meant to integrate with and go beyond standard rehab activities. When someone refers to a luxury recovery center, many people think of celebrity rehab programs. Although some facilities that cater to the rich and famous are luxury recovery programs, you don’t have to be a household name to seek upscale treatment. Different rehab and recovery programs offer different choices for treatment, and there is nothing inherently better about a high-end treatment facility. It is important for a person who is struggling with addiction to locate a program that addresses specific needs and personal preferences.When you are able to feel comfortable with your surroundings, recovery staff and treatment methodology, you are more likely to be able concentrate on dealing with addiction. For some people, that comfort level may only come in a luxurious setting that gives the impression of a leisure hotel. Geographic location: Private luxury centers are more likely to be located in exotic beach areas or secluded country settings. Amenities: A high-end facility may offer private rooms and workspaces, fine dining, room service and other services like those you might find in a hotel. Activities: In addition to addiction-related activities, an upscale program may also offer opportunities for spa treatments, horseback riding, swimming and more. 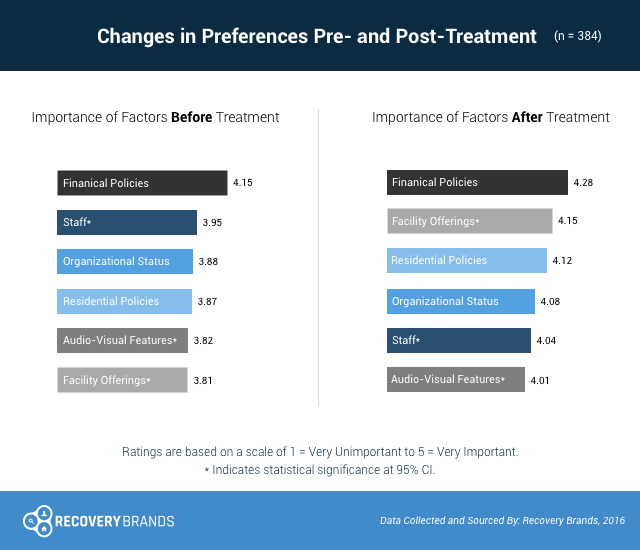 In 2016, Recovery Brands surveyed individuals entering and leaving treatment on what they prioritized in their search for a program. Both groups ranked financial policies as their top priority. However, those leaving treatment considered facility offerings the second-most-important factor. Those entering treatment for the first time ranked it last. Those looking for a serious rehab facility will want to avoid so-called celebrity rehab spas. Designed to provide high-profile individuals with a secluded, restful setting, some of these facilities are little more than spas or vacation getaways. There are celebrity programs that provide actual medical and clinical treatment. But you should always do some research to ensure the program concentrates on proven treatment methods first and offers other activities as secondary luxuries. Detoxification services: that include comprehensive medical care are important because physical symptoms of chemical withdrawal can be dangerous. In some cases, doctors can ease the body’s transition with medications. Dual diagnosis: Certified clinical and medical staff experienced in dual diagnoses are essential for many individuals suffering from addictions that may be related to or cause other disorders. Secondary diagnoses can include sleep disorders, depression, anxiety and other mental illnesses. Customized treatment: Therapy options that address the needs of each individual patient are essential to a good treatment program. Make sure you will have access to individual therapy sessions with a board-certified substance abuse counselor. You may also want a rehab program that offers group sessions and family therapy. 12-Step groups: Introduction to 12-Step methodology within a residential inpatient program can lead to better chances of success after leaving the program. Whether the facility holds actual Narcotics Anonymous or Alcoholics Anonymous meetings or simply introduces the concepts to those in recovery, thinking about life after rehab is an essential part of any treatment. Possibly one of the biggest differences between an upscale treatment facility and a standard residential rehab program is cost. Luxury programs generally cost quite a bit more than regular programs. The increase in costs may cover extra amenities, activities or a posh location. As such, the extra charges are not necessarily covered by insurance, leaving you with a large out-of-pocket expense. Some high-end programs may cater to private customers and will not accept insurance at all. It is important to ensure you can cover costs for a rehab program before checking in. Complicating your post-rehab life with financial woes is one way to increase the likelihood of relapse. Many options are available for those struggling with addiction, and any accredited facility will provide proven treatment methods. Treatment support specialists are waiting to provide you with information about programs available to you, including private luxury recovery facilities in your area. Call today at 1-888-319-2606 Who Answers? for information, no matter where you are in the addiction or recovery process.